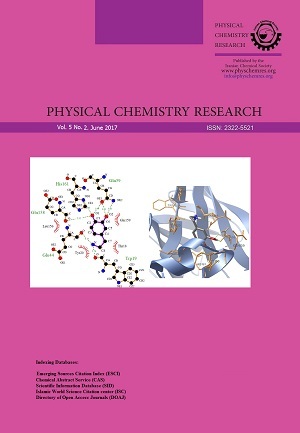 In this work, the thermal reaction of aluminum (Al) and nickel oxide (NiO) was investigated by molecular dynamics simulations. Some effective features of reaction such as reaction temperature, the reaction mechanism, and diffusion rate of oxygen into aluminum structure were studied. ReaxFF force field was performed to study the Al/NiO thermite reaction behavior at five different temperatures (500, 900, 1100, 1200, and 1400 K). 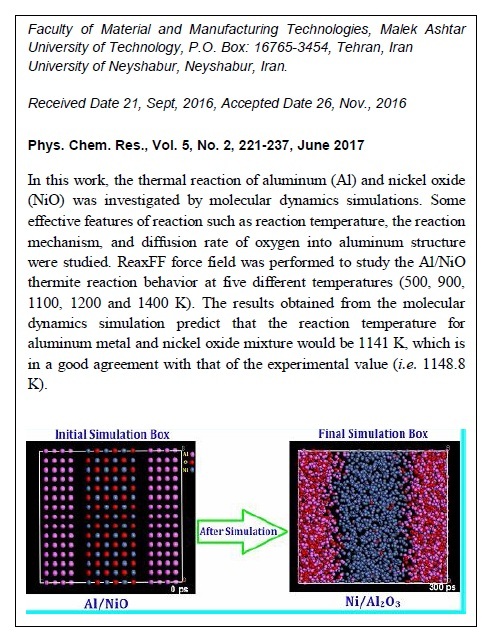 The results obtained from the molecular dynamics simulation predict that the reaction temperature for aluminum metal and nickel oxide mixture would be 1141 K, which is in a good agreement with that of the experimental value (i.e. 1148.8 K). In addition, the mean square displacement analysis suggests that the movement of aluminum atoms is less than that of oxygen and nickel atoms. The estimated diffusion coefficient of oxygen in the aluminum / nickel oxide thermite mixtures was 4.53 × 10-8 m2 s-1. The results show that the diffusion coefficients significantly increase, by increasing temperature.